For proper alignment begin standing with feet hip distance, toes pointing forward. Add a yoga block between legs for additional challenge. Sit down as if you are sitting on an invisible small stool behind you. Squeeze inner thighs and make sure that both knees are pointing forward, draw your shin bones back so your knees hover over your ankles. Continue to focus on squeezing inner thighs or yoga block. Take 10 deep breaths. Repeat for additional challenge. 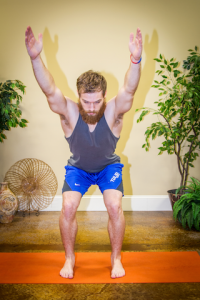 From chair pose, bring hands to heart center. Inhale and reach up through the crown of your head. Pull your thighs back and down to lengthen through your spine. You can also visualize sitting lower on the invisible stool behind you. 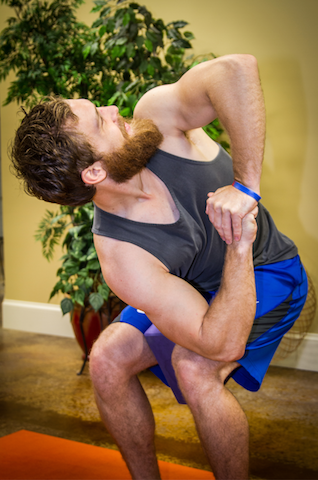 On an exhale, hook your elbow outside your thigh as low as you can and press your palms together. Hold for 5 - 10 breaths, then repeat on opposite side. Open both arms making sure that knees stay parallel. Make a fist with the bottom hand, wrap top hand around it. 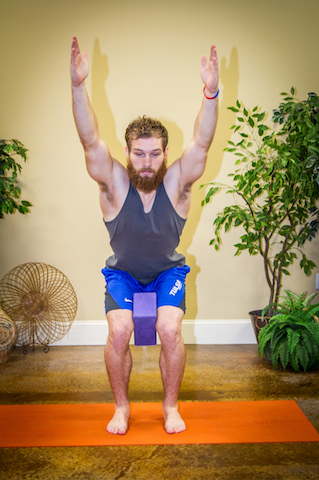 On an inhale, press down toward the leg with the bottom arm. As you exhale, draw in through the belly and add the twist as you gaze over the top shoulder. Try to create a parallel line with the arms as you twist. Do not practice chair pose if you are currently experiencing headaches, low blood pressure, or diarrhea. Always work within your own range of limits and abilities. If you have any medical concerns, talk with your doctor before practicing yoga.